Considering taking the plunge this summer and buying a Hot Tub?Well get yourself down to Harris Pools & Leisure Ltd in Torquay and support the Torbay Holiday Helpers Network at the same time! Local swimming pool and hot tub company Harris Pools and Leisure Ltd have joined forces with local charity THHN hoping to create some much needed funds for the charity. 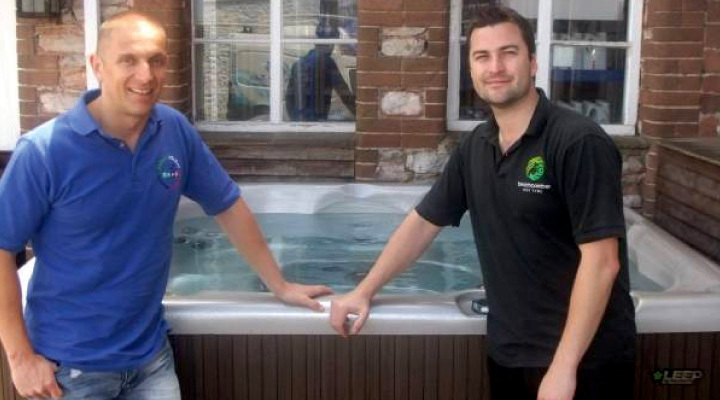 The company have ‘amazingly’ offered to donate £100 from every hot tub sold during July and August direct to the Torbay Holiday Helpers Network. THHN founder Luke Tillen was overjoyed to receive the generous offer, and said the funds will be a huge help towards the charity’s development and on-going work. Kris German, manager of Harris Pools & Hot Tubs said the work that Luke tirelessly puts in to this charity is outstanding. We recognised this and wanted to help in a way that would generate a worthwhile donation to put towards the future of this amazing charity. The Torbay Holiday Helpers Network is a network of hotels, accommodation providers, tourist attractions and businesses who are all committed to helping give away free action packed holidays to families who have seriously ill (life threatening/limiting), terminally ill and recently bereaved children. As well as donating the money to THHN Harris Pools are offering free site surveys with no obligation home visits and quotations to anyone considering or thinking about purchasing a hot tub. Kris says, “Hot tubs are an amazing way to relax, and also great for getting the family together for some quality time to catch up with one another. Hot tubs are becoming increasingly popular and due to our ‘price freeze’ tubs have never been more affordable”. For more information on the charity please visit www.thhn.co.uk or contact Luke on 01803 327353, or for any hot tub enquiries please visit www.harrispools.co.uk or contact Kris on 01803 296336.